The agave has grown to more than twice its size since last year and has procuced three little ones from the roots. The little guy is about the same size as the big one was when I pulled it out of the ground after it had been mowed down several times by the landscapers at the university. It took a little searching to figure out what this little girl was. I say girl because the males are more orange, thus the name. I don't know why she came up this far north. Usually they stay in the south, only occasionally visiting south Texas. More often you can find them in Brazil or possibly south Florida. I guess she was atracted by the turk's cap she was feeding on. Unfortunately I didn't have the pleasure of taking this picture but my wife did along with several other pictures of the yard and gardens. The squase plants are really startgin to produce squash. 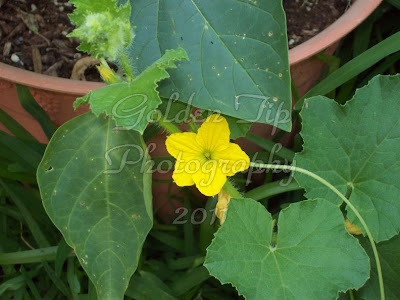 There are several squash forming as well as a ton of flowers. The bees don't seem to mind and are all over it. I'm planning on haveing a lot of squash soup and other dishes soon. 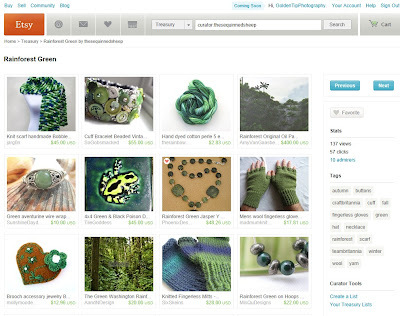 One of the art prints in my etsy shop has been added to a treasury! Lots of green here. It's one of the ones from the trip to Samana, Dominican Republic. Hope I can go back soon, it was lovely there. The Rotary Club came out to the gardens this last Saturday. It took several hours of measuring, cutting and a couple misplaced boards but the result was fantastic. I had to leave before the table was put back in place but even so it was a great project. You could feel the cool from the shade instantly. Plenty of water was provided to keep the workers hydrated and working. Fortunately the heat stayed at bay making the work much more pleasant. From the garden the view of the arbor was great. Hopefully this will attract more visitors to see the nice planter beds. Although we've gotten more rain this month than the last few put together, we're still really low in the ponds and the ground as you can see is still cracked and dry. The ground can swell and shrink by inches depending on the amount of rain. This can really do a number on developments when calculating dirt work but more important is the effects of mosquitos while out trying to garden. With water so low it makes a great breeding ground for these blood suckers. It also doesn't help out on the soccer fields. Not like I play soccer but there's lots of people out at the park who do. Our basil is growing really well. They're the healtiest plants in the side bed, even more than the weeds. So far I can count five plants. Although I wish I had more, this should be plenty to make a small batch of pesto for the winter and coming year. Unfortunately they're already wanting to flower. I really can't blame them since it is getting cooler at night but I have to be attentive to plucking off the flowers or it'll all be gone before I know it. This summer we had to resort to store bought pesto. I can't say it was bad but I'd rather not spend the money if I can help it. With all this rain there is a warning. I know we've been waiting for a good shower for months now but of course when it rains it.... If you don't know the rest then ask your parents who may well go on a long description of what it is and what it meant in the good old days when they were your age. Anyway, the danger we now face instead of scorching heat of an oven is drowning plants, especially for container plants. I have a few in actual cups with no drainage. Now I've poked holes in the bottom and they're all good but in the past I've forgotten and killed many a plant including an apple tree while I was away camping. Fortunately it didn't rain where I was. That would have been miserable. This is also the time to check existing drainage and fix any problems in the yard or garden. Standing water can cause root rot and breeds mosquitos. Remember to keep well and dry off once you're done. A cup of tea would be nice afterwards too. It rained for many hours between last night around 8:00 and didn't let up until after noon today. This has filled my rain barrels to capacity except for one which wasn't on the loop properly. I've fixed this problem since and they're evened out now at about 70% capacity. The remaining tomato plants are shown here. The left one is a new tomato plant that somehow decided that now was a good time to grow while the right shows two already growing tomato plants that are putting out new leaves and with time should give some good fall tomatoes. The onion patch has a single onion left wanting to put out greens but the green onion up front have grown all through the summer. I keep cutting off parts to use for dinner. There's a smaller one in the round planter that seems to need more light. Kind of a runt. New Etsy Store with Garden Photos and More! As was stated in a previous comment of a post I need more pictures. Well, I've put up an Etsy store (http://www.etsy.com/shop/GoldenTipPhotography). Here's a sample of what we're putting up at $25 per print. We'll even mount it on a board for a few dollars more. I've looked around some more and found further survivors of the summer heat. Up front there is still a clump of chives. Half of the lavender plants made it, unfortunately that means that half of them didn't. 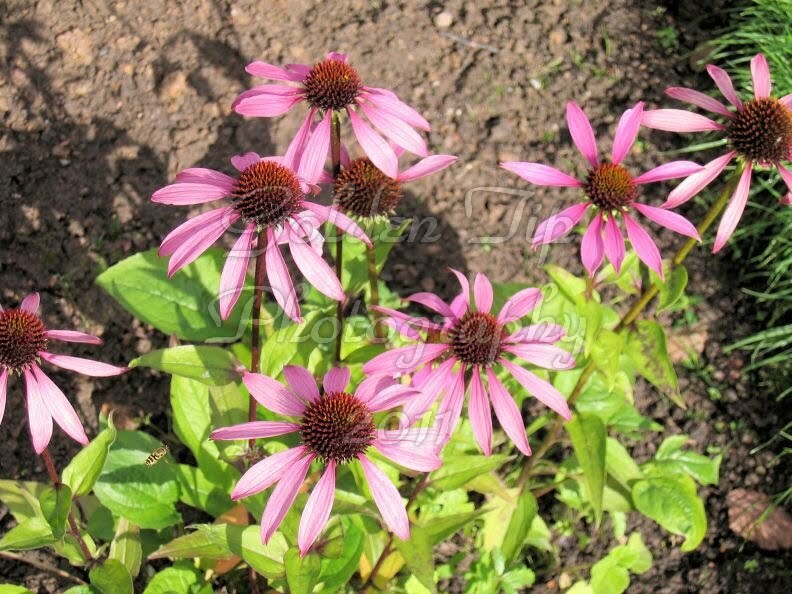 The purple cone flowers have some green left. Since they come up every year from the root they'll be fine. One pepper plant is springing back even though the last peppers it made are still hanging on the plant shrivled up. Out back the tomatoes of course have a few survivors as previously mentioned. My day lilly plant from down south is hanging in there and some of the oxalis around it has shown up again. The onions didn't make it. I got a few out of the dirt but they weren't any bigger than my finger. I need to check on the grape vine. It might be either dead or needing some TLC.